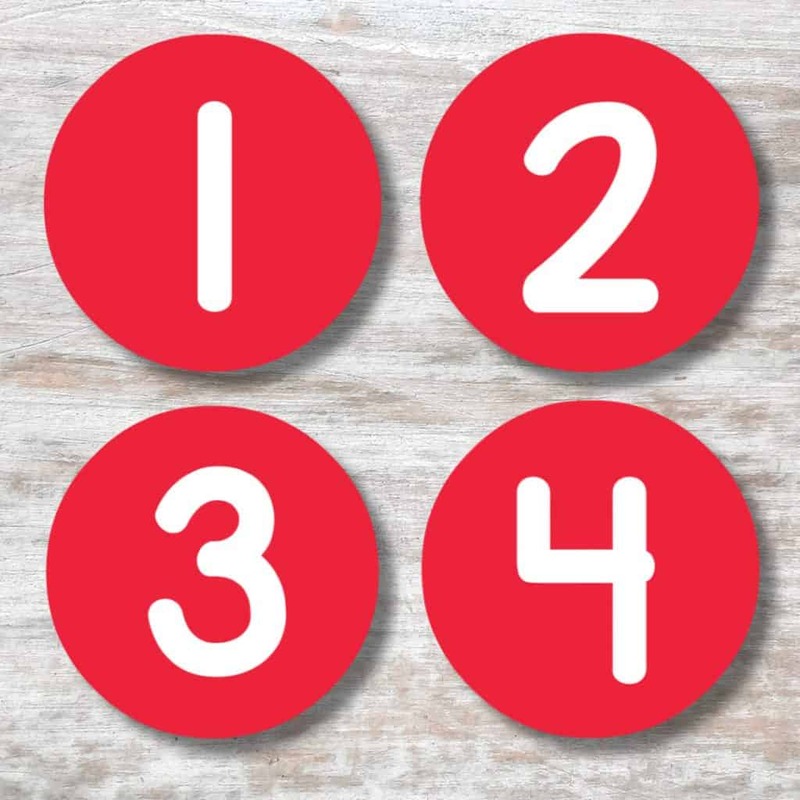 Print and play with these number cards to give your children a hands-on element to math, and to create a number-rich environment. Children learn best through play and hands-on activities. 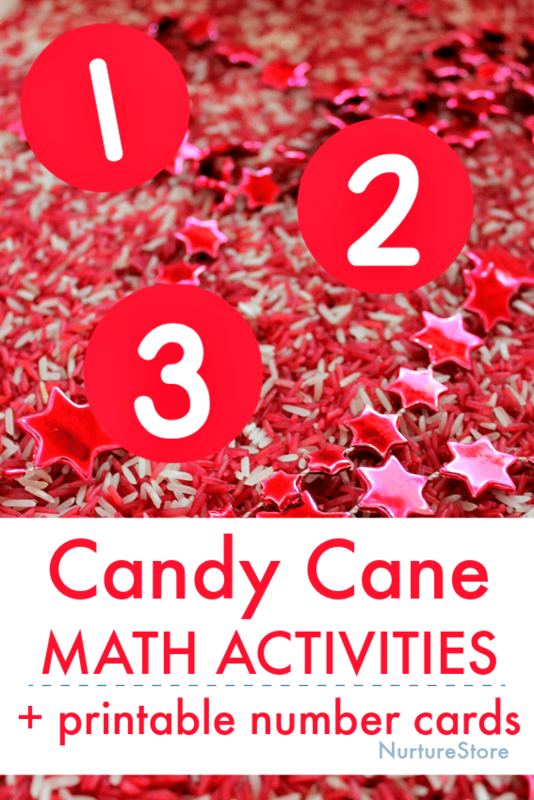 You can use these printable number cards to add a fun candy cane theme to your math lessons this season. Use the cards for treasure hunts, number lines, counting and arithmetic work, along side writing trays and in sensory tubs. The bright candy cane colours are eye-catching and fun, and the cards bring a hands-on element to all your Christmas number play. 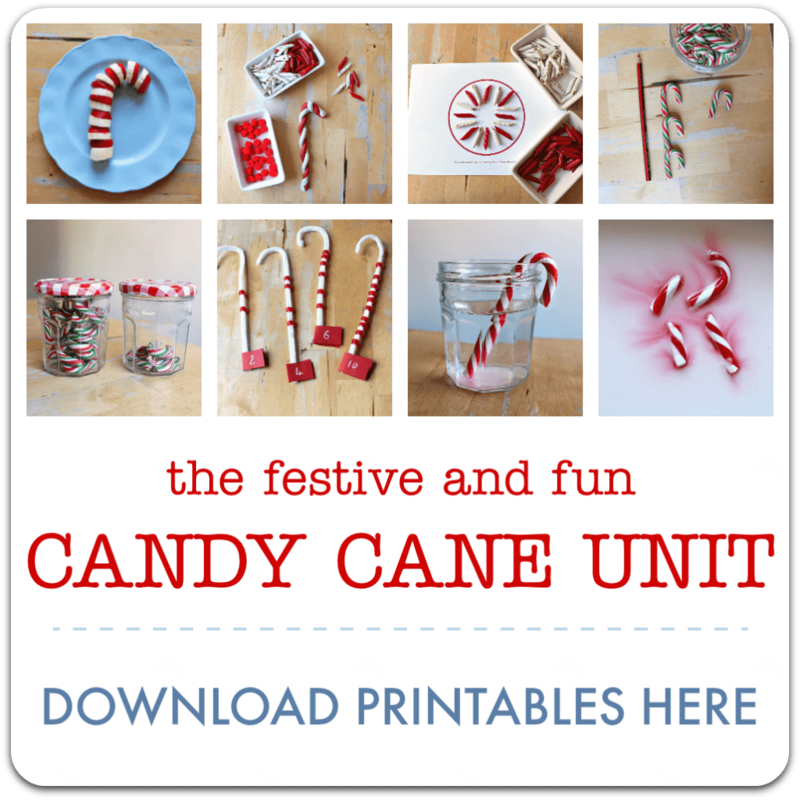 Print the number sheets from the Candy Cane Unit onto card and cut out each circle. You might like to laminate the cards for extra durability. You can use the number cards in all your math play during your Candy Cane Unit. 1 :: Hide them around the house or yard and invite your children to treasure hunt to find them all. Line them up from small to big, or big to small, and count them out going up or down. You can peg them up to make a number line. 2 :: Hide them in a sensory tub filled with sand or rice or shredded paper and let your children dig for them. Seeing numbers in their play helps children become familiar with them, however they are playing. Maybe Mr 1 will have a chat with Mrs 3! Playing with numbers in the early years is as important as doing specific math lessons. 3 :: Print off two sets and play a matching game. Young children could simply work to spot the pairs. With older children you can play ‘Memory’: place all the number cards face down and take it in turns to turn over two cards. If they match, you can keep them. If they don’t, you turn them back over. The person who has the most pairs at the end of the game is the winner. 4 :: Use them to practice arithmetic, working on addition, subtraction, multiplication or division to suit your child. Children could use manipulatives such as pebbles, buttons or real candy canes to help them work out the answers: using real objects (even fingers) for as long as they need to is a good strategy for children to use. We need to understand the real principle of what we are doing before we can move on to doing sums abstractly, using only the digits rather than real things. Encourage your child to use objects for arithmetic for as long as they need to. 5 :: Use them as quick flashcards to practise facts your child has already learned. If your child knows their four times table, you can help them become faster at recalling the answers by having little practices often. Hold up a number card and see if they can tell you what four times that number is. Hi Kristin. Did you see the instructions above that say “If you are already a NurtureStore subscriber: pop your email address in the box below to ‘sign in’ and you will be re-directed to the Creative Kids Library where you will find all our free printables.” Have you already done that?